We live in a new reality, where the production of food, fiber and fuel, and the health and well-being of people, animals and the environment, present difficult challenges and exciting opportunities. This reality requires us to constantly innovate through technology, creativity and complex problem solving. 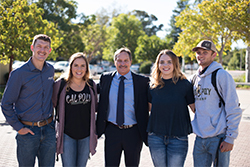 We believe there is no better place to do this than at Cal Poly, and no better way than through our Learn by Doing philosophy. We at the College of Agriculture, Food and Environmental Sciences are ready to lead. We are integrating our faculty and departments to share insights, methods and expertise. We are developing new state-of-the-art labs and instructional facilities. We are actively recruiting faculty with expertise to address automation, water sustainability, data analytics, artificial intelligence and entrepreneurism, in addition to fundamental areas including soil health, experience management, animal behavior and many others. And, we are partnering with industry to train the most qualified, career-ready students, in exchange for access to their knowledge, their guidance, and their investment. But we need your help. In the past, 90 percent of our financial support came from the state of California. Today that level of support has decreased to 40 percent. We’ve had to make up the difference through steadily increasing tuition, but that model is not sustainable if we hope to build for the future – our future, yours and ours. It will take all of us rolling up our sleeves and getting to work together – students, faculty, alumni, industry and supporters. You. Us. This is reality: Our future requires your participation. Bring your expertise and connections, contribute to our strategy and vision, invest in training tomorrow’s leaders in agriculture and land, food production and food safety, and the health and well-being of people and our environment. Fuel the economy in California and beyond. Join us today to help Cal Poly shape a new reality – a better world for all of us. Technology is revolutionizing farming, with automation playing a crucial role meeting the demands of feeding a growing population. Computer technology, data processing and human ingenuity will soon replace and improve certain aspects of human labor with machines. Alumnus Walt Page, 34, a forestry and natural resources major from Tollhouse, California, pursued his passion for the outdoors after graduating from the College of Agriculture, Food and Environmental Sciences in 2012. He does research on hydrogeology, geostatistics and hydrology. Prior to joining Cal Poly in 2014, Malama was a senior member of the technical staff at Sandia National Laboratories in New Mexico, where he investigated groundwater flow and contaminant transport related to geologic disposal of nuclear waste. A look at the achievements of CAFES students over the course of the year. Faculty are immersed in current research relevant to industry demands.